This image, "Skimming The Light" was taken in late February while I was on a trip to photograph some Wilderness Areas just north of Charleston, SC for my "Smallest Wilderness" project. I went into the northern part of Mount Pleasant to grab a bite to eat and thought I'd head over near sunset to the Ravenel Bridge for a little fun sunset/night photography. When I got there and started setting up on the end of the fishing pier under the bridge, I noticed the small groups of brown pelicans were flying very low to the river under the bridge on their way down the Cooper River. Just inches off the surface of the river. 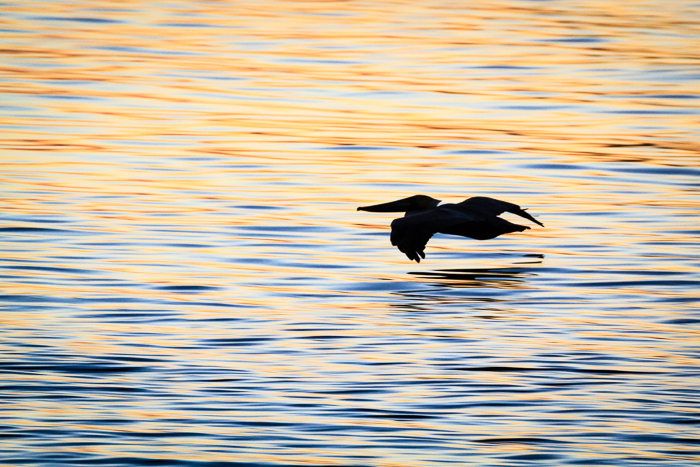 As the sun started setting, the groups of pelicans came at a fairly regular pace. So while my rented Canon 6D was on the tripod for the bridge shots, I popped my rented EF 100-400 f/4.5-5.6L IS II lens on my Canon 7D body and started tracking the pelicans (hand-held) as they flew near the end of the pier. Despite the relatively low light, it was easy to maintain focus on the birds as they were flying exactly parallel to the end of the pier and I could usually roughly preset the focus to approximately the right distance out on the water before the birds arrived. This image was taken at the beginning of twilight, just after the sun sunk below the horizon. There was still plenty of light and color in the sky which reflected beautifully in the ripples on the river. Given the brightness of the water and the relatively low light levels, it made sense to capture the image as a silhouette, rather than trying to capture detail in the pelican. The zoom was racked out to 400mm (640mm equivalent on the 1.6 crop factor of the 7D). So I was trying to keep the shutter speed as high as possible (even with the internal stabilization) while maintaining a decent ISO to reduce noise. I ended up shooting this image at ISO 400 and 1/200th of a second at f/5.6. On some frames the birds were blurry due to unsteady tracking or panning faster or slower than the bird, but on this particular frame I panned with this bird's motion perfectly and the shutter speed was just high enough to keep the bird and water relatively sharp. Most birds were gliding with their wings open quite a bit, like this bird, but it was still a matter of catching the right angle and posture where the outline of the pelican was clearly recognizable. After catching some close-ups of the bridge silhouetted against the sunset sky and tracking pelicans with the telephoto for a while, the twilight sky finally darkened enough for the lit bridge to stand out against it. I liked the deep blue color of twilight above the bridge, while the band of sunset orange at the horizon added complimentary color interest. 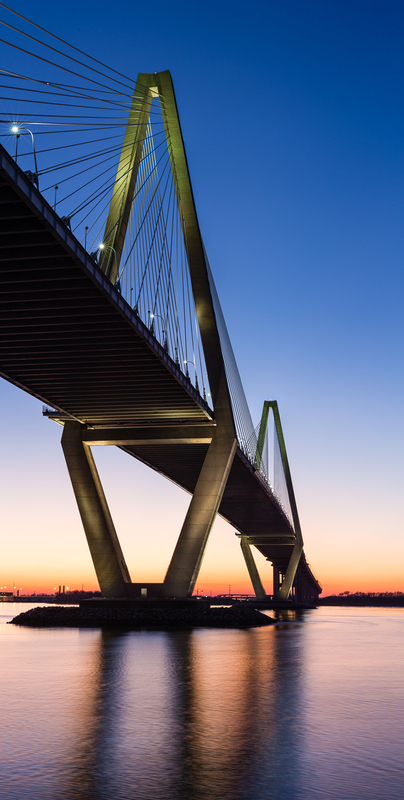 I shot "Ravenel Bridge Twilight" with a rented Canon 6D body, which is a full-frame sensor and has great low-light performance. In order to get the perspective and framing that I wanted for the bridge, I had to shoot with my Sigma 70-300mm f/4-5.6 DG APO lens at 70mm. However, that meant I couldn't fit the whole bridge in one image. So to create this vertical image I shot 7 horizontal images on top of each other, each overlapped by approximately 50%, and stitched them together vertically using the panoramic stitching software in Lightroom and Photoshop. Each image was exposed at 6 seconds at f/16 and ISO 100. Since the camera was full frame, and the panorama is composed from 7 images, the file size and quality on this panorama are huge. Despite the extensive overlap in the frames, all the stitching software and all the different stitching algorithms had difficulty stitching the images together vertically properly and there was an area between the first and second supports where some of the details, including the wires and the upper part of the second support structure, did not quite match up properly. To fix this, I brought the panorama and the appropriate overlapping horizontal frame from the original series into Photoshop as layers. I auto-aligned the layers, which didn't do a perfect job, but enough that the problem areas matched up between the original image and the panorama. I then put a black layer mask on the original image and used a relatively small brush at 50% hardness to paint with white on the mask just over the problem areas in the panorama. This brought in the details from the original image in just those areas and "fixed" the mismatched wires and other details. I hope you enjoyed the "Behind The Images" and feel free to post any questions in the comments section. In the next post, I'll include some more images from my "Smallest Wilderness" trips down South this late winter and early spring.